Last year, in a moment of sugar-induced mater­nal frus­tra­tion, I tried to esti­mate how many treats kids at an ele­men­tary school like my son’s (with no restric­tions on class­room cel­e­bra­tions) get in a year. I started by tak­ing the aver­age class size in the United States (20 chil­dren, accord­ing to the National Cen­ter for Edu­ca­tion Sta­tis­tics). Assum­ing each stu­dent cel­e­brates his birth­day at school, that’s 20 cup­cakes right off the bat. Add in hol­i­day par­ties (Hal­loween, Thanks­giv­ing, Christ­mas, Valentine’s Day, and Easter), spe­cial events (our school, for exam­ple, has a 100 Days of School cel­e­bra­tion every year), and unex­pected extras (rewards for the class, a going-away party for a stu­dent, etc. ), and you have about 10 to 15 more. If each one includes cake, cup­cakes, cook­ies, ice cream, candy and other party food—which most do—that’s about 30 to 35 treats total, or about one per school day for 6 or 7 straight weeks. Ok, so now the ques­tion is, what to bring? Many par­ents are open to (and even happy about) the idea of cut­ting back on cup­cakes. But I can’t quite imag­ine show­ing up at school with a plate of plain apple slices. So I’ve com­piled a list of 18 fun and healthy snack ideas for school par­ties to get every­one started. I pro­vided a sim­i­lar list to my 4-year-old twins’ preschool direc­tor, who passed it along to par­ents in the school’s back-to-school packet. I hope to do the same in the healthy newslet­ter that will be pro­duced each month at my son’s ele­men­tary school (via our new Well­ness Committee). * Pop­corn cups: Have your child help dec­o­rate plain 12-oz. paper cups with stick­ers, glit­ter glue or even his photo, and then fill with home­made pop­corn. Alter­na­tively, dec­o­rate small paper bags or pur­chase movie theater-style pop­corn boxes or bags. * Yogurt par­faits: In clear plas­tic cups, alter­nate lay­ers of your child’s favorite yogurt and fresh fruit such as blue­ber­ries, straw­ber­ries or man­gos. Top with a cup­cake top­per. (And don’t for­get spoons!). * Mini muffins: Car­rot, blue­berry and banana are all great choices. Use all or part whole-wheat flour or add ground flaxseeds for a nutri­tional boost. * Banana bread: Cut in slices like cake, sprin­kle with pow­dered sugar and serve with fruit salad. * Pear bread: Per­fect for a fall party; slice up some fresh pears and add a few to each plate.I made it with white whole wheat flour and veg­etable oil. With 2 cups of sugar, it tastes more like cake than bread. I’d reduce the amount of sugar next time and add more pears. * Choco­late zuc­chini bread: Don’t try to hide the fact that there’s zuc­chini in here! Instead, let your child (care­fully!) help grate it, then bring in a whole zuc­chini for the class to see, touch and smell. I was naughty and added choco­late chips to this recipe; it’s for a party, after all. * Fresh fruit served in cup­cake wrap­pers, waf­fle cones or waf­fle bowls. * Gua­camole: Mash avo­cado, squeeze on fresh lime juice, then mix in chopped toma­toes, diced red onions and a smat­ter­ing of sea salt. Serve with multi­grain chips and veg­gie sticks (cel­ery, car­rots and red peppers). * Berries with fresh whipped cream: Take indi­vid­ual clear plas­tic glasses and fill half way with any mix­ture of straw­ber­ries, blue­ber­ries and black­ber­ries. Top with a dol­lop of freshly whipped cream. 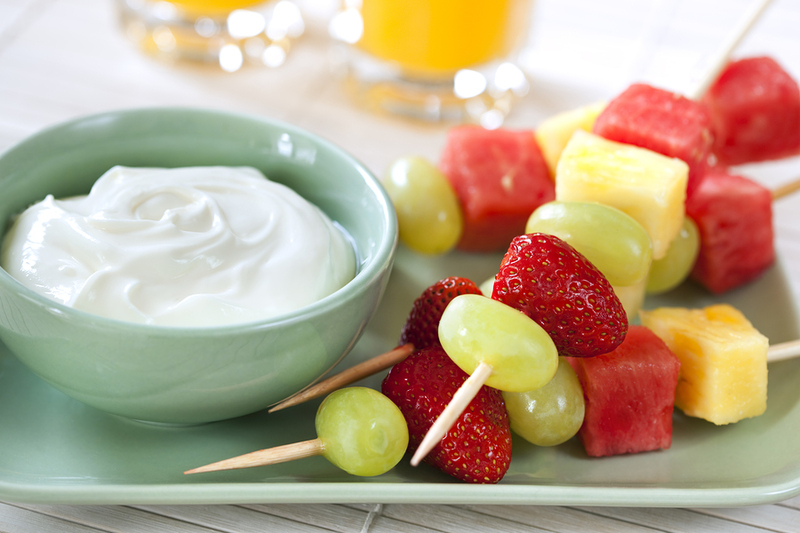 * Fruit kabobs with vanilla yogurt dip: Pick your child’s favorite fruits—strawberries, blue­ber­ries, pineap­ple, kiwi, grapes,and melon, for example—and assem­ble col­or­ful fruit kabobs. Serve with vanilla yogurt dip­ping sauce. * Magic fruit wands: Sim­i­lar to fruit kabobs but made to look like a magic wand, with a whim­si­cal star fruit at the top. * Home­made fruit roll-ups: No corn syrup or arti­fi­cial food col­or­ing; just pure fruit, the way it should be. While the prep is quick, it will take hours for these to set–so leave plenty of time. And do a test batch ahead of time just in case. * Cin­na­mon tor­tillas with fruit salsa:Take wheat flour tor­tillas and brush with melted but­ter. Sprin­kle the tor­tillas with cin­na­mon sugar; cut each tor­tilla into 8 wedges and bake on an ungreased cookie sheet at 350 degrees for 10 min­utes or until crisp. For the fruit salsa, pick any com­bi­na­tion of your kid’s favorite fruits—apples, straw­ber­ries, kiwis, pineap­ple and black­ber­ries all work well—dice and mix with a lit­tle sugar and lime juice. Serve salsa in mini plas­tic cups or bowls with the tor­tilla chips on the side on paper plates for dipping. * Straw­ber­ries and Cream Elves: Straw­ber­ries filled with a dab of cream cheese mixed with fruit spread and choco­late chip eyes. Too cute for words! * Yogurt par­fait bar: Serve vanilla or straw­berry yogurt in cups. Set out top­pings such as fresh berries, bananas, gra­nola and shred­ded unsweet­ened coconut. * Pizza Pret­zel Bites: Yes, it’s pizza–but at least it packs some nutri­tion, espe­cially if paired with a tomato mari­nara dip­ping sauce. * Bring in his favorite game or book or a spe­cial art project to share with his class. * Put together a “goody bag” of non-edible treats such as glow sticks, bal­loons, stick­ers, tat­toos, etc. *Make him or her line leader or star stu­dent or get­ting some sort of spe­cial priv­i­lege for the day. A Healthy School Birth­day Party–But Did We Really Need the Food? Do you have any fun, cre­ative and healthy food ideas for school par­ties? Please share them in the com­ments sec­tion below! All of the above ideas sound like so much fun. The prob­lem with schools here in MO is the food brought into schools for par­ties has to be “store bought”. Noth­ing can be home­made. Any sug­ges­tions on healthy store bought ideas. I am ask­ing because I can not think of any other than fruit pre­cut in the store which is not very exciting. Stephanie, thanks so much for your com­ment! Some the ideas on my list could be eas­ily done with store-bought ingre­di­ents: Frozen yogurt tubes and fresh fruit; store-bought (ver­sus home-popped) pop­corn in fun cups or bags; fruit kabobs with vanilla yogurt; yogurt sun­dae bar. I am think­ing that I should do another blog post on based on your feed­back, tho. But in the mean­time, here are a few more ideas: store-bought angelfood cake (cut into chunks) and fresh straw­ber­ries on skew­ers; fresh berries and store-bought whipped cream; smooth­ies made with store-bought ingre­di­ents; Food Should Taste Orig­i­nal Sweet Potato Chips; Quinn Pop­corn (www.quinnpopcorn.com; note: I have not tested this yet, but I have a box sit­ting in my kitchen and plan to do so later today. The Ama­zon prices are out­ra­geous, so look for it at Whole Foods or a local store!). I was going to post the same com­ment about store bought. Thanks for the info. Great sug­ges­tions. My sen­ti­ments exactly, at my daughter’s Daisy troop, one par­ent is sup­posed to bring a ‘snack’. Since when did cup­cakes become a snack??!! GRRRR! Scary to think of all the junk they get at school. And that’s not count­ing Scouts, soc­cer, and Sun­day school. I agree, Robin! They get treats left and right. Which makes them not really a “treat” but more of a habit that they’ll undoubt­edly strug­gle with when they’re older. Not good! Thank you thank you Stacy!! As Co-Chair of our School Health Team, this is exactly what we are faced with. These are great ideas! The Health Team has also offered to pay for the birth­day child to have one cup­cake on their birth­day instead of the par­ents com­ing in to feed the entire class and par­ents love that idea; saves them money and the kids calo­ries. Our next intent is to change the habit of offer­ing food as an incen­tive for kids in their school­work and behav­ior. You are right, there are plenty of non-food rewards to be had!! Thank you for your blog! Thanks for your great com­ment! Always love to hear about a school mak­ing pos­i­tive changes. Nice idea to have just the birth­day child get a cupcake–makes it special! In our schools, “store bought” means that the sealed pack­ages must go to the school. You can­not sim­ply buy all of the ingre­di­ents at the store and then re-assemble in some cre­ative way at home…like mak­ing fruit skew­ers or putting pop­corn in cute con­tain­ers or assem­bling par­faits. It’s a strug­gle. Love your ideas, though! I can always use some of them at home. I for one, miss the home­made cup­cakes that were once served at school (gasp), and I’m here today, happy and healthy. I have fond mem­o­ries of choco­late cup­cakes and Hawai­ian punch at school… Aren’t we going a bit over­board with the fruit kabob vs. (the evil) cupcake??? Jody — I agree that there’s noth­ing like a good home­made cup­cake. Unfor­tu­nately, most of the cup­cakes served in school these days are pur­chased at super­mar­kets and con­tain all sorts of arti­fi­cial ingre­di­ents and preser­v­a­tives that have been linked to seri­ous health prob­lems includ­ing can­cer. And as a mom, I can attest that my kids are being bom­barded with junk food almost every­where they go, from school to the children’s library to sports prac­tices. So they def­i­nitely aren’t being deprived. And most of the kids who cel­e­brate their birth­days at school end up hav­ing par­ties out­side of school as well. To me (and count­less mem­bers of the med­ical establishment–sorry, not try­ing to throw it in your face), school seems a per­fect place to try to scale back and bring some healthy mod­er­a­tion into their lives. Why on earth wouldn’t we want them to asso­ciate healthy foods like fruit kabobs with plea­sure and cel­e­bra­tion? You may be here today, happy and healthy, but I can assure you that the major­ity of our coun­try is not doing so well. One thing i thought of with bring­ing in fruit for exam­ple, and i may be exag­ger­at­ing, but a lot of kids don’t even like or take fruit or just nor­mal food so that could be a chal­lenge. i feel like pre­sent­ing this web­site (or just this subject)to my kids’ school. any sug­ges­tions on how to go about doing that? oh and milk or choco­late milk…it never even dawned on me..is choco­late milk necessary?! I think kids might be more open to fruit if it is pre­sented in a fun and/or appeal­ing way. Plain orange or apple slices might seem bor­ing while fruit kabobs with a yogurt dip feel like more of a treat. I think some­times it just requires a lit­tle cre­ativ­ity. As far as pre­sent­ing this web­site to your kids’ school: I might start by talk­ing to the school prin­ci­pal and see how he/she feels. Try to iden­tify other par­ents who might value healthy eat­ing and talk to them about form­ing a group to lobby for health­ier changes. See if your school has a well­ness com­mit­tee and find out what your school dis­trict well­ness pol­icy says. There are many resources on my site (under RESOURCES and HELPFUL LINKS) on the Top Nav menu. I wish you lots of luck and feel free to write back with any Qs! Thanks so much for shat­ing. For good­ness sakes those who think our chil­dren should be filled with sugar,additives,coulourings and junk food at kinder or school. Are we help­ing them learn how to make healthy choices or are we allow­ing other peo­ple to fill them with rubish! I cer­tainly allow my child not so healthy food but I choose when that’s the point?cake or choco­late treat for a birth­day every week is not on one par­ent did a lolly bag full. At Xmas my child got cards but 8 candy canes is insane my book,! We think no cake means depri­va­tion! It’s not how many cakes does a child need for one birth­day as long as they are made to feel spe­cial they do not care. I am in the process of get­ting our kinder to change there ways I hope I can. I am sad­dened by the fact that my child will grow up asso­ci­at­ing a cel­e­bra­tion with party pies,nuggets,lollies and soft drinks it makes me feel sick. It’s like some adults are like drug push­ers push­ing junk to our kids for a sugar and addi­tive hit. For good­ness sakes. In “the old days” we fed our kids healthy food every day and gave them treats on hol­i­days. My kids are nearly grown and are healthy by everyone’s standards. I never made a big deal of food except to encour­age good food by pro­vid­ing tasty treats. At Hal­loween, there was always left over Easter candy to toss and at Easter there was always a stash of old Hal­loween candy. Mod­er­a­tion in all things.…including moderation. I never gave my kids food as rewards except at Christ­mas I let them pick any­thing that they wanted in the fruit and veg sec­tion. They loved choos­ing a huge apple or exotic fruit, some­thing we would not nor­mally buy or afford. Lighten up. The real prob­lem in Amer­ica is that we have stopped mak­ing our meals from “scratch.”. If we fed our fam­i­lies home cooked meals that we pre­pared from local farms and sup­pli­ers, a gooey treat at school would not be a threat. But I think the food police par­ents are going too far. My kids eat at home except a lunch and snack at school; how can a hol­i­day party pos­si­bly destroy a kid’s life? Lee: I wel­come all opin­ions on my blog. But I believe that you are mak­ing sev­eral incor­rect assump­tions. First of all, most of today’s kids are NOT being fed healthy food every day and get­ting treats just on hol­i­days. Instead, they are liv­ing on sug­ary processed junk that has become the typ­i­cal Amer­i­can diet. Sec­ond, in many school class­rooms, par­ties hap­pen weekly, not just on hol­i­days. When my old­est child was in kinder­garten (a few years ago), his class cel­e­brated every birth­day, star stu­dent week, spe­cial occa­sion (read­ing chal­lenges and 100th Day of School) plus hol­i­days (Hal­loween, Thanks­giv­ing, Christ­mas and Valentine’s Day) with junk food. That added up to close to about 50 sug­ary treats through­out the school year. My con­cerns are shared by many other par­ents and the vast major­ity of child health and obe­sity experts. With type 2 dia­betes soar­ing amongst ado­les­cents (23 per­cent of Amer­i­can teens are now dia­betic or pre­di­a­betic), cut­ting back on junk food in the class­room is an impor­tant move. So before you tell me to “lighten up” or refer to par­ents con­cerned about their kid’s health as “food police,” I rec­om­mend doing your home­work and wak­ing up to the facts. I, too, believe in mod­er­a­tion. By insti­tut­ing healthy class­rooms, we can come closer to achiev­ing mod­er­a­tion and ensur­ing a healthy future for our children. My son’s preschool doesn’t allow any sug­ary snacks includ­ing cake or cup­cakes and it must be store bought and sealed. Grow­ing up we were allowed to bring home­made sand­wiches juice cup­cakes… but so much has changed and I for one think hav­ing only healthy snacks pro­vided by oth­ers is a great idea that way I can be sure that he ain’t hav­ing 30 cup­cakes in o e school year! I love ur ideas but can’t use them at school but don’t mean we can’t use them@ home. Hello. Thanks for the post. I wish my kids school encour­aged less sugar in school snacks. Last year my youngest daugh­ter was diag­nosed with T1D ( type one dia­betes) now we have to watch every thing she puts into her mouth. It can be very hard with all the par­ents giv­ing their kids candy and junk food every day. At first my daugh­ter would cry all the time because all the other kids could eat sugar all day when­ever they want, but she has to test her blood and get insulin shots for any­thing she eats, and who wants to have to get extra shots so they can have a birth­day treat sev­eral times. Month. One day I hope schools will go the healthy way or only allow non food items for birthdays. Jeni — As you might imag­ine, I’m with you!!! With all the dia­betes, food intol­er­ances and aller­gies, and ADHD these days, many kids end up being excluded when food (espe­cially unhealthy processed junk) is served in the class­room. At school, we really need to con­sider the health and wel­fare of ALL stu­dents. NONE of them need more cup­cakes, candy and other junk in their lives. Thanks for rais­ing this impor­tant issue! I love these ideas. The prob­lem is that our school will only allow indi­vid­u­ally wrapped, store bought items. Any more ideas for non-food or healthy store bought birth­day treats for the class? Hi Sam — I’m work­ing on putting one together. The indi­vid­u­ally wrapped cer­tainly makes it an extra chal­lenge! Sounds like they are just beg­ging for highly processed food. To get you started, I’d sug­gest lit­tle bags of pop­corn (non GMO) if you can find them. Omg! I’m so happy to hear more par­ents try­ing to push this at schools! My cowork­ers tease me because I don’t gen­er­ally give my boys any sug­ary foods or snacks. So I am happy to say I will be shar­ing this site with two ladies who recently had babies. Some­thing for them to think more about! Also my sons preschool encour­ages the birth­day child to bring in canned foods to donate to the local food pantry and not hav­ing any sug­ary foods! I’m all for that! But there are some cute ideas pro­vided on this site so I thank u! Vickey, thanks so much for your com­ment! For­tu­nately, more and more par­ents ARE push­ing for health­ier food in the class­room. You def­i­nitely are not the only one! Thank you for shar­ing my post with your friends and for being an advo­cate for change! I def­i­nitely appre­ci­ate becom­ing health con­scious in class­rooms. In my son’s kinder­gar­den class, they are hav­ing a total of 3 or 4 par­ties this year, — no birth­day par­ties are per­mit­ted. Great idea– how­ever, with hav­ing only 3/4 par­ties a year, it seems a shame we can’t even have those lit­tle cup­cakes that are bite sized that you can buy in stores now. What’s the harm in 1 mini-cupcake sur­rounded by fruit a per­haps a choco­late cov­ered straw­berry. That seems to com­pro­mise & keep things in mod­er­a­tion, while remain­ing healthy, but that isn’t even allowed. Our party of cel­ery, water & pop­corn (which is a chok­ing haz­ard to young kids) is really the most excit­ing party they’ll get in all their school years? It seems a lit­tle over­board to me.